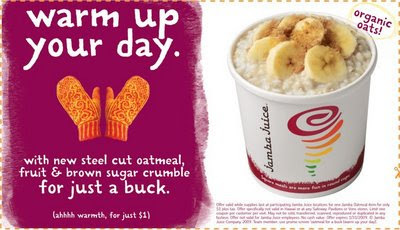 Try New Jamba Juice Oatmeal for a Buck! Jamba Juice has brought it. Oatmeal that is. Though Starbucks recently launched its hot oatmeals, Jamba Juice has now launched a similar product. Three flavors including: fresh banana, blueberry blackberry and apple cinnamon. Around 280-290 calories per serving. Ingredients are simple: steel cut oats, soymilk and toppings. Sounds pretty good right? Click read more to find out my one major peeve with this new Jamba Juice product...Oatmeal is healthy. Fresh fruit? Great! Soymilk instead of dairy? Great! So I figured. Oh good-it's vegan. But after checking on the Jamba Juice site I did not see the new oatmeal on the vegan menu items list. In tiny print in the nutrition info I saw that the toppings/sugar crumble contains both wheat and milk! Why go to all the trouble of using soymilk if you are going to ruin the dairy-free thing with milk containing toppings? Oh well. I guess I can eat it without the toppings. But the truth is that I'd rather get my oatmeal at home. I'm waiting for JJ to bring back the Jamba soups! Because I love a good healthy on-the-go soup.